I want to answer a common question that will flow through this entire issue: why a yellow jacket? As an American living in Paris, being “yellow” is NOT a good thing.. But there is a French law that requires all autos to have 1 ‘ Emergency yellow jacket’ inside the car at all times. If you are pulled over, for whatever reason (profiling is allowed here), and there is no jacket – you will be given a fined. SO now you can understand why Everyone has this jacket – the government forced them to buy it ! As for poetic justice this forced purchase has now united so many French people, that crosses barriers such as race and age and economic standing. (Because we are all “Economic Slaves”, if you need a paycheck). There has been much news about the destruction going on in Paris and other parts of France, and I must say – I still support the “Yellow Cause”. Unless the Fake Media wants to be truthful (don’t hold your breath), we need to look at WHY this started. Many will say, it was for young punks to break & steal things, but this is Not true. It started, like in the USA, of over taxation. I will attach a sample paycheck to shock all of you into the current melt down in France. So WHY does the current political elite in France think, they are immune to this? Because they have a police force? This is an error of judgment, for people like myself, have not gone into Paris on Saturdays, for the simple reason of the weather, its damn cold here! But with warmer weather the predations are more and more will venture out on to the streets, to protest the unbearable tax burden placed on the “Working poor”. The annual taxes paid by a simple worker earning GROSS = 26,000.00 twenty- six thousand a year. The paycheck “stub” is very complicated (typical French) but I compared that to the other expensive city that I lived in (NYC, San Fran.) and France is more expense not just on the paycheck ..but wait ..there is more ! EVERYONE must pay a “TV Tax”, a left over from the 1950’s? (hello “I love Lucy”) which is 160.00 this year 2019 & can increase whenever.. 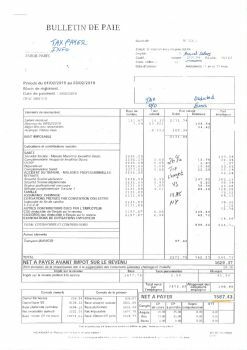 I live in Provins and for 100 sq meters pay 1,000 euros per year, in Paris it would be 4,000-10,000 euros. If you live in France, you will pay this tax, it is charged to every person, owning or renting in this socialized country. For our modest home in the country this is an additional 800.00 per year. Don’ t forget about sales tax! And for all those who say “well you have medical insurance” , have not been following me. I have a KNOWN skin disease, that IS NOT covered! Rosacea is on my face and makes the skin so hot & infected that I have to have painful laser treatments to control it. These treatments are 250.00 per visit and NOT TAX DEDUCATBLE off my French tax return either! Food costs about the same, as in NYC, but the taxes on items are much higher. 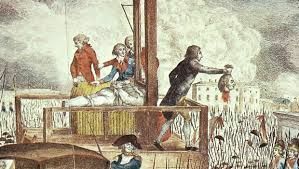 So as inflation eats away annually 3% of the little paycheck I collect ..keep in mind, that MANY of the French are in this same boat..working 35 hrs a week, only for more & more taxes to bear. That final straw of the added gasoline tax, is what broke the silence. I am lucky, because I take a train into Paris for my job. On the bottom of the paycheck you will see, the boss gives me back a small allowance for this cost (NAVAGO) .. but the pass is monthly 75.00 a month which covers trains & busses. But this is not tax deducible either. Which does not include all the NON- covered medical expenses I have to pay. ← Oct. 2018 in Paris, looking at Louis V.